Alex Ferguson may have played a masterstroke with his handling of the Rooney affair. So it was all a storm in a tea cup. A little tantrum. A cry for attention. Call it what you will, but Wayne Rooney’s dramatic about-face over his decision not to sign a new deal with Manchester United caught us all on the hop and left this particular journalist dumbfounded as to why his dirty laundry was ever aired in public. A day ago Wayne Rooney was on his way to becoming a pariah at Old Trafford, not just for rejecting the offer of a new contract, but for damning the club as un-ambitious and a spent force in terms of its ability to sign big name players and win major trophies. Wazza was on his way to Real Madrid, Manchester City, Barcelona, or Chelsea, take your pick, and was destined to be a target for the Red Devils’ boo boys for the rest of his career. So what happened? Did Sir Alex Ferguson, already earmarked as “a genius” by Rooney in the midst of all the kerfuffle, work his magic again? Well that’s what Wazza says, though can we believe him after the schizophrenics of the last few days? Uhm, excuse me Wazza, but didn’t you have the same conversation before announcing your departure? And didn’t you then draw exactly the opposite conclusions? And if you were so undecided about your feelings why not keep quiet about it? After all, your current contract isn’t up until the summer of 2012 so you had time. Here’s what I think happened, and this is pure speculation just for the fun of it, Rooney got played. I don’t believe for a second that he’s changed his mind about United. I think his initial conclusions about the club’s lack of ambition and ability to attract top players were wrong, but I firmly believe that’s what he thought, and that‘s what he still thinks ( or will once he lays down in bed tonight and actually starts thinking). I also think Sir Alex Ferguson knew that Rooney’s mind was made up. But that’s when Fergie boxed clever. Instead of going on an obvious offensive, giving Wazza the infamous “hairdryer” treatment in public, Fergie acted wounded and bemused, appealing to Rooney’s better nature. Every parent will recognize the “Son, after all I’ve done for you, what have I done to deserve this?” shtick. Well, I say every parent, but Rooney’s son is only a baby so obviously he won’t have had need for that trick yet. Regardless, it’s a common ruse and it worked on Wazza, introducing a bit of guilt into the equation. Fergie then played another master stroke, describing the Rooney situation as “a bagatelle”, which means something trivial, and stressing that the most important thing is not the whims of one player but the club itself, notably, its next game with Stoke City. That surely left Rooney’s obvious sense of self importance deflated, and, by stressing the club above all else, Fergie opened the door for the loyal United fans to weigh in with their damning comments about their former hero’s behavior. And they did, in droves on this website and on sites around the world. So you see Fergie barely had to lift a finger in heaping more guilt than he could handle on Rooney’s shoulders, and his softly, softly approach, that essentially allowed others and Rooney’s conscience to do the dirty work, has paid off. He’s inked a five-year deal and, what’s more, will be more motivated than ever to perform by way of an apology to the fans and his team-mates for the shenanigans of the last few days. Fergie you ARE a genius. I am personally believe that Manchester United is of the top strongest teams in Europe & around the world under the wonderful guidance of the super smart Coach Alex Ferguson's. I also amaze when read that it online that the genius ManUnited striker Wayne Rooney was I would to say Rooney Manchester Fans around the world would love to see score more in the coming Premier League season.Ronny think about your Fans your Club, you fans are expecting more titles and goals from you and all of the greatest stars of the Manchester United. Is the beautiful game in decline? High wage demands, exorbitant ticket prices and clubs' mounting debts make headlines for all the wrong reasons. Perhaps it's the tulip mania of our age. Whatever any body thinks of SAF, one thing is for sure, he will go down in history as one of the greatest managers of all time, if not the greatest ever. His managerial credentials are without compromise. Looking at the Roney situation, i doubt whether the concerns were about the current situation, but more to do with the future. The players comming in, who would replace Fergie, what would happen to United when Fergie goes etc. I think this is the case because it is highly likely Fergie will retire within a year or 2. I am sure that even when he retires, like all United legends, he will still be around behind the scenes, the next manager will be Jose and that the Glazers will always find the money to buy the players the next manager wants. You see, even the Glazers can not dictate terms to Fergie, it is Fergie that tells everyone what he wants and they go and get it for him. You see, for all the players that come and go, the one thing that no United fan will never allow to happen is the mistreatment of SAF. He is the only person likely to be bigger than the club. The problem was always going to be, who will take over from Fergie and will that next person be allowed to dictate the way Fergie does. We all know that the next manager will be Mr Muriniho and we all know he too does not suffer fools. You can bet your bottom dollar that the top line of his contract will state, i am the boss, i am in charge and you give me what i want. 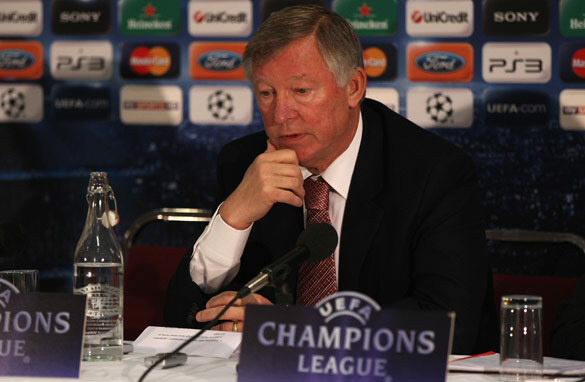 I think the future after Fergie was always going to be the single biggest concern for all United fans world wide. My only concern abut Jose is whether he will be prepared to stay for 10 years or longer to continue the dynasty. Remember, Jose is a calculated man with a plan. He has stated that he wanted to win in England, Italy, Spain, come back to England then manage Portugal, then retire. Lets see. Good luck Wayne, its now time to put your hard hat on and start to build those bridges. i beg to differ, i'll tell you how it want..............Rooney was told in no uncertain terms that united would not sell him, they told him that if he did not sign he would play on the reserves or sit on the bench for the rest of his contract thereby killing his england career and angering his sponsers. Now he will play for united and once he hit peak form united will sell him at market value rather then a "fire sale" price. "Uhm, excuse me Wazza, but didn’t you have the same conversation before announcing your departure"
How you concluded that conversations that led to Rooney's public outburst and to his eventual contractual agreement were "the same" is beyond me. The truth is that both you, me and everyone else outside Old Trafford does not know what was said in any of these meetings and assuming that both conversations were essentially "the same" is a case of speculation or opinion. I suppose everyone is entitled to an opinion but in this instance it is used to undermine the character/intelligence of another. Well Mr. Journalist. It seems I'm the first and only one to comment, so I'll just say two things. First of all, a lot of United fans don't really care what people like you think because they all know Rooney will always be a United player. Secondly, he's had enough 'attention' as it seems, so what happened would not have helped in any way. So you saying it was cry for attention was just plain stupid and silly...really. Being a United player is more than attention in the first place. I'm not sure your assessment of the situation is correct. We first need to find out how much Rooney was paid for the additional 5 year contract. Maybe it's Rooney who is the genius... make a lot of noise pretend to want ot leave get a big contract and play some more. After all, it is he who had 2 more years to play before his contract expires. This is sad, is this even the writing of a CNN jounalist? Beacause you certainly come across as a smarty pants blogger, all opinionated speculation with no well thought out reasoning. Rooney absolutely committed a crime against Man United especially to the fans and there must be punishment, for him 30 goals in the premier league with at least a goal against each of the so called big four and Manchester City since they are not among the big four, yet. And also 10 goals in the Champions league. you dont need to be a genius to pay a player 250,000 pounds a week! How people like Jim, Saby and Osas can attack the writer instead of the subject of the writing is beyond me. All the facts of this article are correct. Rooney said he didn't get the answers he wanted the first time he asked questions about United's future plans, then said he got them when he asked a second time during the meeting with Ferguson and the other United officials the other day - which just happened to take place after he'd been slammed by media and fans alike for his attitude. He even apologised for his negative comments and his disrespect towards Sir Alex. How much more of an admission of guilt do you want?.. The rest of the article was just light-hearted speculation, which you might have gathered by the phrase "Here’s what I think happened, and this is pure speculation just for the fun of it."... Read before you criticise. You'll just embarrass yourself if you don't. Players come, players play and players go. But Sir Alex Ferguson continues to be a pillar of strength for club and fans. He is indeed an unique role model for football managers. Wayne Rooney's comment about Man United is shocking. United is still one of top clubs in the world and the club have also contributed to the growth of his career. The way Sir Alex handled the situation is commendable. However, I am glad this Rooney issue has been resolved. I hope he can now concentrate and give his best to United. Wazza, you have got yourself a 250,000 pounds a week contract . We are expecting more goals from you this season. Man United for life. Wayne Rooney,you are the reason why some of us love man utd.If you say somethings like this about the team,then you are discouraging us from supporting ManUtd. Well spotted, Alehandro! What would be the point of any blog if it did'nt provoke some controversy?